11 November 2010. This edition is packed full of new stuff, including special discounts for Christmas shoppers in our online shop, and how you can have your photo voted the best and see it pinned as the headline to a Place. Hi ExplorOz Reader, here's the latest news and updates from the ExplorOz Team, we hope you enjoy it! The highest rated photo from any Place page will be automatically selected and shown at the top of any Place page, so the control is in your hands! Each Member Profile page now provides a list of "My Places" - based on uploads that member has made to the Places database. 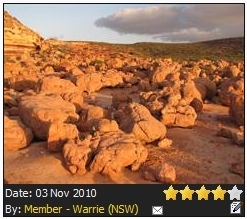 For people such as Member - Warrie (NSW) who is a regular contributer, this shows over 300 Places. This features means your profile will automatically create the list so now its super easy to store/share your photos and comments on Places you've been. TIP: the easiest way to add Place photos & comments is by mobile phone/email during your trip. For help, seeGetting Started: Mobile Updates. We all know Christmas is a hard time financially, so why not take a look at what you can turn into cash using the ExplorOz Trader. Sure you may not have a large ticket item such as a vehicle, camper or trailer ready to sell, but anything you no longer use is worth advertising if you can turn it into a bit of spare cash. So dig out that box of parts & spares, camping gear, or fishing tackle, take a few photos and create aNEW LISTING in the Trader and watch it turn into Xmas Cash! We have 13 categories including Miscellaneous and an Australia-wide audience of 1 million viewers per month. Listing fees start at just $19.95. Doesn't that sound like a good deal? ARB 4x4 Accessories. Don't miss ARB's limited time special offer featured on the ExplorOz Home Page.